Exactly what Karl Marx would have made of it we will never know, but last night, the theatre in Havana that bears his name played host to a rock concert by the Manic Street Preachers. Given that the Manics once released a single called The Masses Against the Classes, Karl's spirit may have looked kindly down on the Welsh trio as they played for an audience of locals, especially since the band had opted to charge only 25 cents admission. That's certainly what the Manics are hoping for, anyway, because while this concert was ostensibly to launch their new album, Know Your Enemy, it doesn't actually come out until the end of March. The Havana concert was really about the band attempting to regain some of the credibility that they lost over the past decade as they gradually mutated from four angry, punkish, frankly irritating kids to a well-oiled pop machine with a trophy cabinet full of Brits -the kind of band that would take their own Portaloos to Glastonbury and put a sign on the door telling everyone to keep out. It's an age-old story in rock. You start out as the angry alternative to bloated big bands, then you become the very thing you railed against. 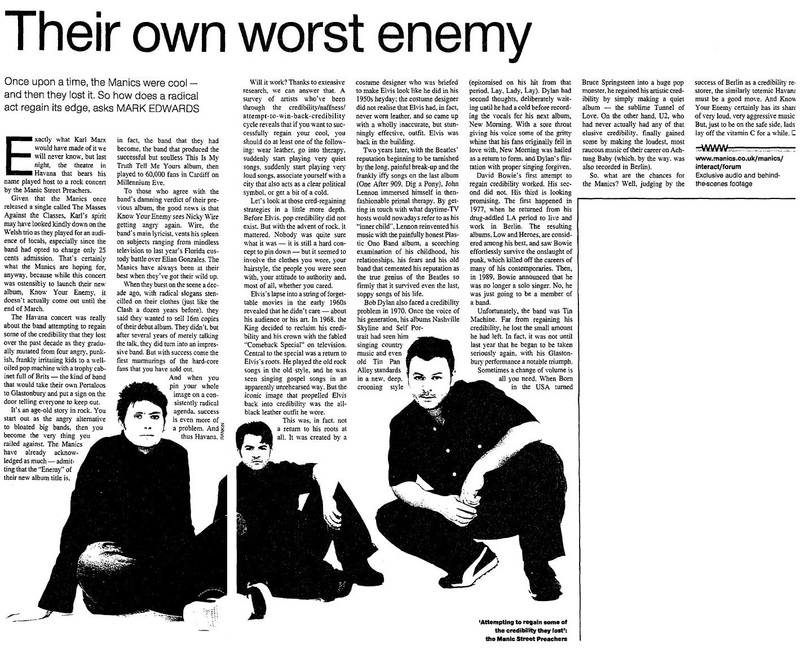 The Manics have already acknowledged as much -admitting that the "Enemy" of their new album title is, in fact, the band that they had become, the band that produced the successful but soulless This Is My Truth Tell Me Yours album, then played to 60,000 fans in Cardiff on Millennium Eve. To those who agree with the band's damning verdict of their previous album, the good news is that Know Your Enemy sees Nicky Wire getting angry again. Wire, the band's main lyricist, vents his spleen on subjects ranging from mindless television to last year's Florida custody battle over Elian Gonzales. The Manics have always been at their best when they've got their wild up. When they burst on the scene a decade ago, with radical slogans stencilled on their clothes (just like the Clash a dozen years before), they said they wanted to sell 16m copies of their debut album. They didn't, but after several years of merely talking the talk, they did turn into an impressive band. But with success come the first murmurings of the hard-core fans that you have sold out. And when you pin your whole image on a consistently radical agenda, success is even more of a problem. And thus Havana. Will it work? Thanks to extensive research, we can answer that. A survey of artists who've been through the credibility/naffness/attempt-to-win-back-credibility cycle reveals that if you want to successfully regain your cool, you should do at least one of the following: wear leather, go into therapy, suddenly start playing very quiet songs, suddenly start playing very loud songs, associate yourself with a city that also acts as a clear political symbol, or get a bit of a cold. Let's look at those cred-regaining strategies in a little more depth. Before Elvis, pop credibility did not exist. But with the advent of rock, it mattered. Nobody was quite sure what it was -it is still a hard concept to pin down - but it seemed to involve the clothes you wore, your hairstyle, the people you were seen with, your attitude to authority and, most of all, whether you cared. Elvis's lapse into a string of forgettable movies in the early 1960s revealed that he didn't care -about his audience or his art. In 1968, the King decided to reclaim his credibility and his crown with the fabled "Comeback Special" on television. Central to the special was a return to Elvis's roots. He played the old rock songs in the old style, and he was seen singing gospel songs in an apparently unrehearsed way. But the iconic image that propelled Elvis back into credibility was the all-black leather outfit he wore. This was, in fact, not a return to his roots at all. It was created by a costume designer who was briefed to make Elvis look like he did in his 1950s heyday; the costume designer did not realise that Elvis had, in fact, never worn leather, and so came up with a wholly inaccurate, but stunningly effective, outfit. Elvis was back in the building. Two years later, with the Beatles' reputation beginning to be tarnished by the long, painful break-up and the frankly iffy songs on the last album (One After 909, Dig a Pony), John Lennon immersed himself in then-fashionable primal therapy. By getting in touch with what daytime-TV hosts would nowadays refer to as his "inner child", Lennon reinvented his music with the painfully honest Plastic Ono Band album, a scorching examination of his childhood, his relationships, his fears and his old band that cemented his reputation as the true genius of the Beatles so firmly that it survived even the last, soppy songs of his life. Bob Dylan also faced a credibility problem in 1970. Once the voice of his generation, his albums Nashville Skyline and Self Portrait had seen him singing country music and even old Tin Pan Alley standards in a new, deep, crooning style (epitomised on his hit from that period, Lay, Lady, Lay). Dylan had second thoughts, deliberately waiting until he had a cold before recording the vocals for his next album, New Morning. With a sore throat giving his voice some of the gritty whine that his fans originally fell in love with, New Morning was hailed as a return to form, and Dylan's flirtation with proper singing forgiven. David Bowie's first attempt to regain credibility worked. His second did not. His third is looking promising. The first happened in 1977, when he returned from his drug-addled LA period to live and work in Berlin. The resulting albums, Low and Heroes, are considered among his best, and saw Bowie effortlessly survive the onslaught of punk, which killed off the careers of many of his contemporaries. Then, in 1989, Bowie announced that he was no longer a solo singer. No, he was just going to be a member of a band. Unfortunately, the band was Tin Machine. Far from regaining his credibility, he lost the small amount he had left. In fact, it was not until last year that he began to be taken seriously again, with his Glastonbury performance a notable triumph. Sometimes a change of volume is all you need. When Born in the USA turned Bruce Springsteen into a huge pop monster, he regained his artistic credibility by simply making a quiet album -the sublime Tunnel of Love. On the other hand, U2, who had never actually had any of that elusive credibility, finally gained some by making the loudest, most raucous music of their career on Achtung Baby (which, by the way, was also recorded in Berlin). So, what are the chances for the Manics? Well, judging by the success of Berlin as a credibility re-storer, the similarly totemic Havana must be a good move. And Know Your Enemy certainly has its share of very loud, very aggressive music. But, just to be on the safe side, lads, lay off the vitamin C for a while. This page was last modified on 25 March 2018, at 17:14.